In 2008 Willem Engel founded dance school DançAlegria. Willem’s passion for the Brazilian partner dance Zouk was the driving force for the first few years. However, in 2014, DançAlegria became one of the first studios in The Netherlands to teach solo dance as well as partner dance styles, followed by a name change to DA Dance Studio in 2015. The various styles offered by professionally trained dance teachers are one of the characteristic of DA Dance Studio. Willem has been a Zouk specialist since 2005. 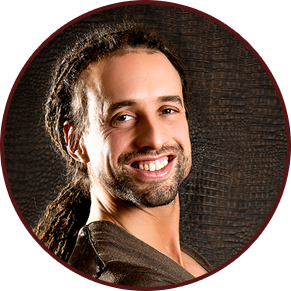 Since 2013 he has been broadening and deepening his knowledge and skills as a dancer and as a dance teacher by taking classes in other styles as well. We work from a comprehensive concept for dance lessons. We give our students more selfknowledge, more fitness, more social cohesion and more social skills. Our students gain self-esteem from the satisfaction of their growth. We teach them to enjoy the growth process without focusing on the end goal too much. Next to this, what sets us apart as a dance school is that we teach both solo and partner dancing lessons. In our methodology we stimulate the connection between partner and solo dancing, as developing as a dancer yourself strongly support your abilities in partner dance. The development of the student is important to us and central in all the lessons. We have a great professional team that together make this dance studio what it is. If you want to meet our teachers and support team, click here.